Stephen Lewis is a well-caffeinated mission strategist and critical thinker who grew up in six countries on three continents, yet finds himself inexplicably living in Indiana. The son of missionaries with World Gospel Mission, Stephen grew up primarily in the small country of Burundi, East Africa. Upon return to the United States, Stephen went to high school in Indiana, completed his senior year as an exchange student in France, before moving on to Gordon College in Wenham, Massachusetts. While at Gordon, he studied French, Spanish, and Italian, eventually earning at bachelor’s degree in economics with a minor in French and ultimately spending his senior year at Oxford University in the United Kingdom. He returned to Indiana to pursue at master’s degree in TESOL at Ball State University, intending to stay only two years but nearly became a professional graduate student. In 2003, he wrapped eleven years of working with international students at BSU, having earned a double master’s in TESOL and applied linguistics and completed most of the work for a PhD in linguistics, as well as dabbling in computer science and information management. Stephen came to Church of God Ministries in 2003 as the corporate editor and the public relations officer. When Church of God Ministries expanded their publishing, he also took on the responsibilities for managing the book editorial process. From the beginning, he has been a member of the Disaster Relief Committee at Church of God Ministries, taking on the responsibility of chair in 2014. 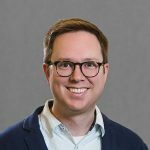 In 2015, he stepped into the role of associate director of Global Strategy, working closely with Ben Shular and Andrew Gale, with direct responsibility for communications, recruitment, and membercare.